Salvage diver Lyle Craigie-Halkett sips a glass of water (he's done a lot of talking to old chums and his throat is dry) in the splendidly restored first class dining room of the SS Great Britain and recalls the time a welly boot came smashing through the ceiling. "That used to happen quite a lot - it went with the territory on this job," he says. Today was a time for old stories as dozens of people - divers, salvage experts and tugboat crew members - were reunited in Bristol to remember how they helped rescue the first great ocean-going liner and return her to her home city exactly 40 years ago. Isambard Kingdom Brunel's magnificent vessel had been scuttled in shallow water in the Falkland Islands at the end of her working life. She became a popular destination for picnickers and mussel-hunters but was rotting away until a scheme to refloat her and bring her back to the UK was hatched in 1969. "People thought it was a crazy idea and perhaps it was," says Craigie-Halkett. "But we went for it anyway." And thanks to the skill of the team, not to mention the cash of tycoon businessman Jack Hayward and dozens of mattresses donated by islanders to plug a worrying hole in the vessel, the rusting hulk was refloated on to an enormous pontoon and towed almost 8,000 miles across the Atlantic. 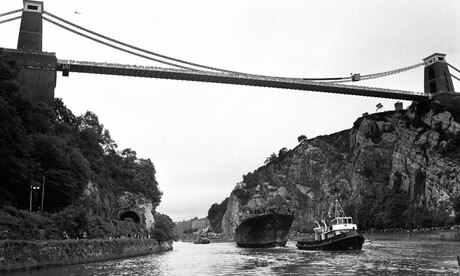 Thousands turned out on 19 July 1970, as she was guided up the Avon river and into Bristol where she has been lovingly restored and is now one of the south-west's most popular tourists attractions. The memories came thick and fast today. Another of the divers, Stuart Whatley, described how the project came together thanks to "good planning, good logistics, fantastic improvisation." He also remembered the mussels with huge pleasure. "The ship was covered with them, eight or nine inches long, the biggest I've ever seen. The cook came along and collected bags full of them and we had them for tea. They were marvellous." Ivor Boyce, the captain of the tug boat John King, that carefully guided the ship upriver after its ocean crossing, remembers the crowds. "It was just a mass of people. The diesel noise was overpowered by the people cheering and honking. It was very, very moving."